Johannesburg - Pitso Mosimane reckons Mamelodi Sundowns delivered a determined effort against Ajax Cape Town, but felt Downs' fans deserved the credit for last week Friday's win. According to the Football411.com website, a wonder-strike in the dying seconds of extra-time from Tebogo Langerman earned the Brazilians a 1-0 victory over the Urban Warriors and a place in the Nedbank Cup last-16. The Chloorkop Cheeseboys were in full-cry at the Cape Town Stadium, with Mosimane most appreciative of his Pretoria outfit's faithful supporters. "Our supporters drove us to victory, and we are grateful to them for the way they carried themselves," the Downs coach told the club's official website. The way they kept singing the entire match kept us in it and gave us belief going forward. "This is what we need, actually this is what football needs because players are more motivated when the 12th man is on form. Our victory is dedicated to our supporters. "Ajax gave us a run for our money, but we had a huge advantage over them in the stands. We out-numbered and out-sang them, which is where I believe the match was won." 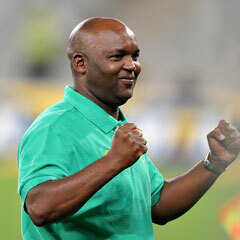 Mosimane had hoped to rest a few of his stars in Cape Town, but the former Bafana Bafana tactician claimed his players were having none of it. "Seeing that we have been playing back-to-back matches in the league, I was tempted to change the team a little bit, in order to rest a couple of players but the players told me that they didn't need the rest. "I must take off my hat to them too, because they really proved that they wanted to win for the club."